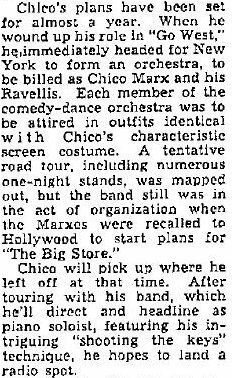 When the Marx Brothers had released The Big Store in 1941 - at the time annonuced as their last film - Chico fulfilled an old wish to form a big band of his own. Having linked up with jazz band manager Ben Pollack, he launched his solo career in January 1942. Pollack was the head but Chico had name recognition and fronted the band at the piano. They assembled a group of sixteen solid musicians including eight brass (three trombones), six saxophones plus a vocal group. Chico's band did fairly straightforward dance-band material, enlivened by his distinctive fingerwork on the keys. Chico performed 15 minutes of his inimitable piano solo but the show usually started with a couple of tunes from the orchestra. After the first numbers Chico would come out for a short monologue and then introduced the vocalists. While they were singing in group or solo, Chico would sit on the edge of the bandstand eating a banana or a carrot. When the singing was over, Chico stuffed the banana skin in the breast pocket of the vocalist. Then an old-style vaudeville act would be brought on, followed by more sentimental tunes with ironic remarks from Chico. The band opened in Flatbush, Brooklyn, on 15 January 1942. 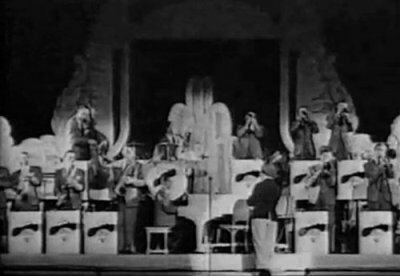 Judging from the above piece in Billboard, it was the vocal group who was called the Ravellis, but even though Variety once referred to the band as Chico Marx and the Chicolets, the usual billing was Chico Marx and his Orchestra or Chico Marx, his piano, and orchestra or - simply - Chico Marx Orchestra. The idea of each member being attired in outfits identical with Chico's screen costume was probably never realized, but the music-stands and the drumskin at least sported a cartoon of Chico's head. After Brooklyn, the band moved on to the Windsor, Bronx and the Central, Passaic, New Jersey. On 2 March they played in Cumberland, Maryland, and later that month they appeared in Cleveland, accompanying harmonica-player Larry Adler. 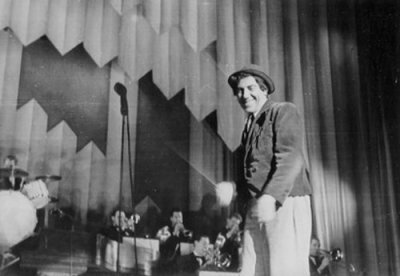 On 13 March 1942 the Chico Marx Orchestra performed at the Stanley Theater in Pittsburgh, a show which was broadcast locally over radio station WCAE as Stargazer Programme, hosted by Ray Spencer. A nine-minute segment of this show has survived but Chico is not heard on it. Vocalists at the time included Bobby Clark and Cpl. Ziggy Lane. Three days later, 16 March 1942, the band again performed at the Stanley Theater in Pittsburgh, this time in Keep 'Em Smiling, a public service broadcast for Defense Stamps. 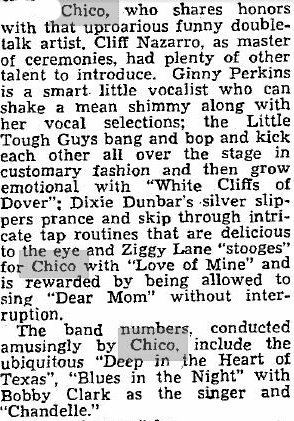 Vocalists were Ginny Perkins and - again - Ziggy Lane. Chico was interviewed and got evasive about questions regarding his personal life, then spent some time introducing members of the newly-formed ensemble. Lane was also interviewed. The program was originally scheduled to run 15 minutes, but it was allowed to run over by another 7 minutes. It was broadcast locally over radio station WWSW. 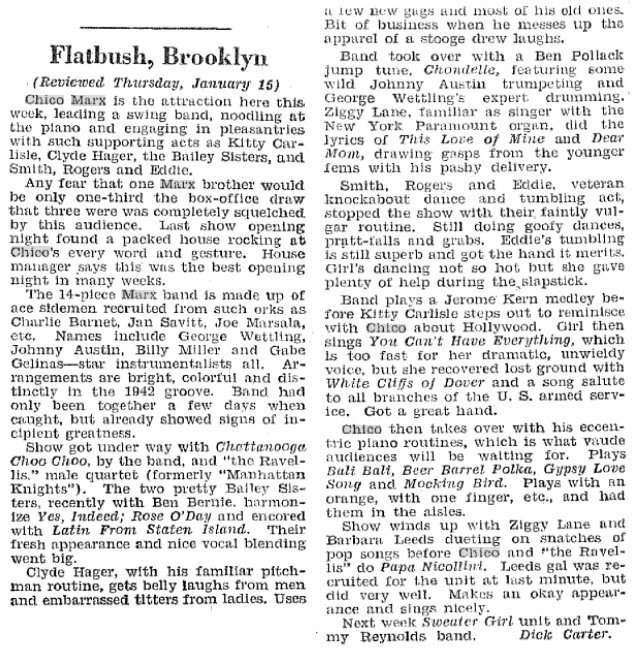 Beginning on 4 April 1942, Chico's band played three nights at the RKO Temple Theater in Rochester, New York, and on the 11th, they played the RKO Boston Theatre in Boston (dates provided by Nancy Mess). On 24 May 1942 The Waterloo Daily Courier in Waterloo, Iowa, reported they were going to appear on the Paramount theatre in Waterloo "next Friday, Saturday and Sunday" (dates provided by Nancy Mess). While in Iowa they also played in Cedar Rapids and Sioux City. Around the year 2000, a set of autographs from the Chico Marx Orchestra from spring of 1942 were on sale on eBay. Chico's signature was dated "April 30th 1942, 10:45" and below this were some of the band's autographs, including Ziggy Lane, Marty Massala, Marty Napoleon, Bob Clark, Wally Brown and Nick Collins. These autographs are dated as May 30th 1942. Wally Brown (October 9, 1904 - November 13, 1961) was a vaudevillian (from Malden, Massachusetts) and the same may have been true for Collins. In June, two records were issued, with vocals by Ziggy Lane and Skip Nelson. That month they also played in Wisconsin, appearing in Sheboygan on the 8th, at the Capitol in Madison on the 13th and in Manitowoc on the 17th (dates provided by Nancy Mess). They also played in Oshkosh and Kenosha. In July, Chico Marx Orchestra played at the Palace on Main Street in Peoria, Illinois, and then played at the Orpheum in Los Angeles on 18 August 1942. In October, the band opened a two-month engagement at the Blackhawk Café in Chicago, broadcasting hightlights on a local radio show and drawing a crowd of 4000 to a venue supposed to hold 500 persons. It was around this time that Chicago-born Mel Tormé joined the band as singer and vocal arranger. He was very young - turning 17 on 13 September 1942 - but eventually replaced George Wettling as the band's drummer. Fuel rationing forced the band to remain in Chicago for two more months. 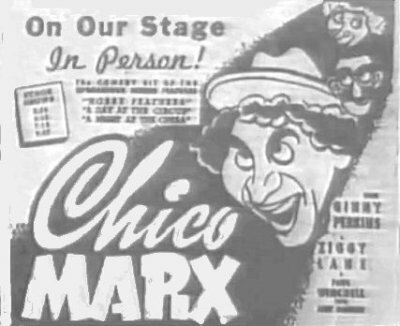 Several of the band members were born in Chicago and of course Chico was no stranger to the town either, having lived there with the rest of the Marxes from 1909 to 1920 (see The Marx Brothers in Chicago). One evening Harpo surprised Chico with a visit to the Blackhawk and apart from playing the harp, Harpo is also reported to have held his trademark nonsensical speech from the dance floor, a speech which originated from Fun In Hi Skule and re-appeared over the years, for example in the stage version of Go West. 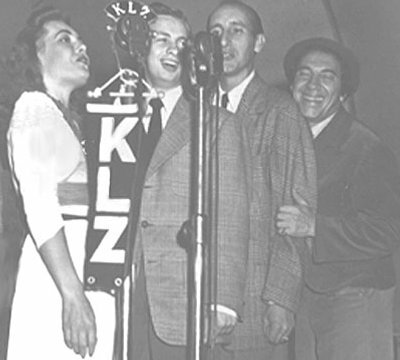 More broadcasts followed after Tormé had joined the band, like a show for KLZ, Lake Side Park, in Denver (also featuring Elisse Cooper, Johnny Frigo and Bobby Clark as vocalists) and the Fitch Bandwagon on 20 December 1942, hosted by Toby Reed and eventually available on record. 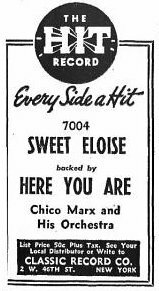 Chico Marx Orchestra spent New Years Eve at the Blackhawk in Chicago, and then played mostly in the east in the spring of 1943. 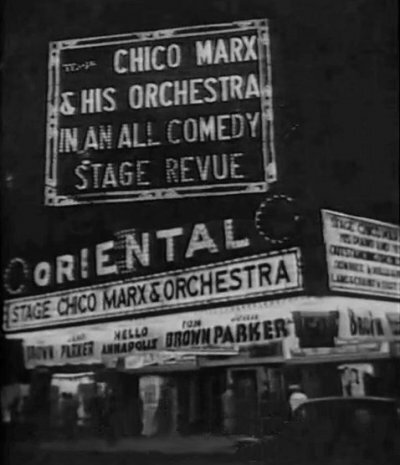 Chico took time off for a short illness during which Harpo stood in for him for one week at the Cleveland Palace, and in April the band played at the Roxy in New York City. They were back at the RKO Boston Theatre in Boston around 23 April (date provided by Nancy Mess). The band broke up in July 1943 at the Golden Gate Theatre in San Francisco. The Chico Marx Orchestra was probably never caught on film. However, they left some traces in A Night In Casablanca and Love Happy, the Marx films that followed. In A Night In Casablanca, Chico is performing with a small jazz orchestra and it's likely that the routines that followed was based on performances by the Chico Marx Orchestra. The first number is even The second movement from the Beer Barrel Polka, followed by Moonlight Cocktail, a #1 hit for Glenn Miller and also featured on Mel Tormé's 1960 theme record Swinging on the Moon (consisting solely of songs about the moon as a romantic symbol). Beer Barrel Polka starts with Chico tapping a conductor's baton to get the attention of the band, then swinging the baton a couple of times in the air before throwing it at one of the trumpeters. Moonlight Cocktail is played with Chico and another pianist and has them and the whole band bouncing up and down in rhythm with the music. Soon, the bounces of Chico and the other pianist become unsynchronized and more and more violent. Finally, Chico has to stand up, caressing his behind with one hand while continuing to play with the other. Love Happy features Chico and violinist Leon Bellasco performing Gypsy Love Song, a recreation of Chico's routine with band member Johnny Frigo (and perhaps an even older number dating back from the days of Nightingales and Mascots when Chico performed in a similar way with either with cousin Lou Shean, Arthur Gordon or George Lee). 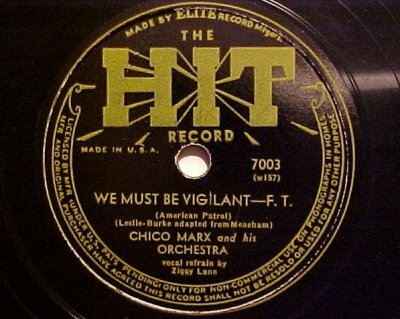 Chico also performed a similar piano/violin-duel in a 1948 TV show, i.e. before Love Happy. (22 June 1903 - 7 June 1971) Born in Chicago to a well-to-do family, Pollack was self taught and became the drummer for top jazz outfit New Orleans Rhythm Kings in the early 1920's. His eye for talent led him to either discover or employ musicians such as Benny Goodman, Jack Teagarden, Glenn Miller, Jimmy McPartland and Harry James. This ability earned him the nickname "Father of Swing". He tried his hand organizing a record label, Jewel Records, and at other venues, including restaurants on the Sunset Strip in Hollywood and in Palm Springs, California. 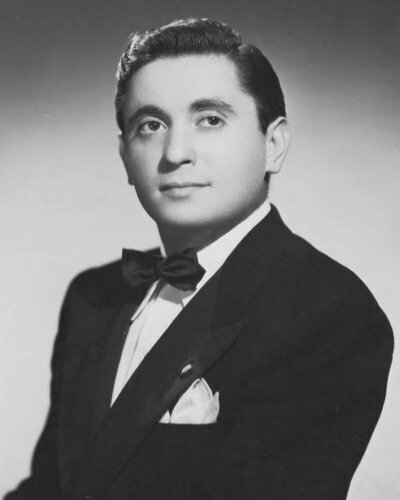 (13 September 1925 - 5 June 1999) Born in Chicago to immigrant Russian Jewish parents, Tormé began singing publicly at the age of four, acting by age nine, and playing drums in Chicago's Shakespeare Elementary School drum and bugle corps by the time he was a teenager. In 1940, at the age of 15, he auditioned a song he had written, "Lament to Love" for bandleader Harry James, also playing drums at the audition. 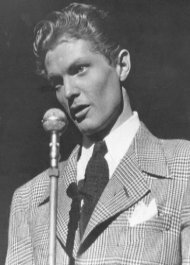 James did record "Lament to Love" for Columbia Records, and it spent a week at number ten in the charts in August 1941. 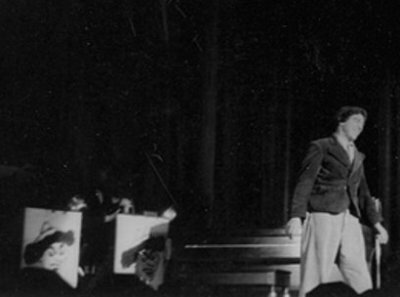 In August 1942, Tormé joined Chico's band. When the band broke up in July 1943, Mel Tormé continued to sing and compose for several decades. (27 December 1916 - 4 July 2007) Born in 1916 on the south side of Chicago, Frigo's earliest gigs were playing string bass and tuba in nightclubs and amusement parks. About the time with Chico's orchestra, Frigo says: "I joined him in Kansas City. Chico heard that besides bass, I played violin so he told me to bring my violin to the next performance...he called me up with my fiddle and started asking me questions, I gave him answers. Some of them turned out funny and, after two or three cities, we had a routine. But then I saw one of the Marx Brothers' movies. There was this actor named Leon Bellasco...he was a continental-type head waiter - he played all those parts - and he also played violin. While I was watching this movie I realized that Leon was doing all the little routines I had created with Chico". (17 October 1923 - 6 May 2004) Kessel was born in Muskogee, Oklahoma. One of the finest guitarists in jazz history, he was largely self-taught after just three months of lessons at the age of 12. At age 19 Kessel went from Muskogee to Los Angeles. Some local musicians told him about a rooming house for musicians not far from the bus station. There was nobody there when the phone rang in the hall, so Barney answered. They were looking for the guitar player. Kessel said "I am the guitar player", went down for the audition and landed his first job which was with Chico. " We played a lot of theaters, we did the Roxy in New York. We played the Blackhawk restaurant for four months in Chicago, and when Chico did his numbers - his stage show - he would lead the band, we'd play with him". After touring for a year, Kessel settled in Los Angeles. He later was to play with band leaders like Charlie Barnet, Benny Goodman, Artie Shaw and Charlie Parker. 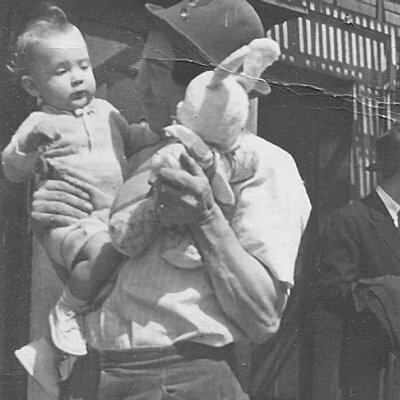 (12 July 1919 - 19 June 1953) Villepigue was born in Ottawa, Kansas. He worked as composer, arranger, and teacher of modern music from the late 1930s to the early 1950s, from big band to bebop to modern jazz. For the four-month engagement in Chicago, Chico Marx added some of the local talent to his orchestra, including Paul Villepigue and Vern Yocum. During that period, Villepigue wrote at least a dozen arrangements for the band, among them Velvet Moon (which can be heard on the Arnaz/Marx Laserlight CD). (2 June 1921 – 27 April 2015) Born in Brooklyn, New York City, Marty was the nephew of trumpeter Phil Napoleon and the younger brother of pianist Teddy Napoleon. He was originally a trumpeter but heart troubles caused him to switch to piano. He still couldn't read music when he joined the Chico Marx Orchestra without realizing they were touring theatres playing for acts. On about the second week out, Chico told the band that the next day they'd be playing for harmonica player Larry Adler, and part of his library contained Gershwin's Rhapsody in Blue, piano solo and all. He asked one of his friends in the band to help him learn to read, and slowly but surely began a period of study that eventually took him to the professional level he'd always hoped to achieve. When interviewed in 2002 by Leo Ball for Allegro, Marty said : "I spent an awful lot of time with that band in the bathroom". Napoleon gained his greatest fame for playing with Louis Armstrong, Gene Krupa and Coleman Hawkins. He semi-retired in the 1980s and passed away in 2015, 93 years old. (28 November 1907 - 6 June 1968) Born in Topeka, Kansas, Wettling was one of the great Dixieland drummers. He moved with his family to Chicago in 1921 and became a part of the Chicago jazz scene of the 1920s. He played with virtually everyone in the Chicago jazz field, as well as Benny Goodman, Billie Holiday, Sidney Bechet, Artie Shaw, Paul Whiteman and Muggsy Spanier. After stints with Joe Marsala and Ben Pollack, Wettling became a regular with Eddie Condon on his Town Hall broadcasts and at his club. He died in 1968 in New York City. (2 April 1909 - 27 April 1975) The younger brother of clarinetist Joe Marsala, Marty was a trumpeter who was at his best in Dixieland-oriented settings. He started out as a drummer, playing in Chicago with groups led by Red Feilen and Joe Bananas. Marsala switched to trumpet in the late 1920s. Although he gigged steadily, Marsala was virtually unknown until 1936, when he moved to New York and recorded with his brother. He was with Will Hudson's Orchestra for a short time in 1937 but mostly played with Joe's band until 1941. After playing with Chico Marx's band (1942-43), Marty served in the Army (1944-45) and then rejoined Joe for a short time in 1945. He moved to San Francisco in the mid-'50s and gigged with Kid Ory and Earl Hines. From the late 1950s on he was less active due to erratic health, although he played off and on until retiring in 1965. Born Armide Whipple, Kim sang under that name with Bob Crosby’s Bobcats and Jimmie Grier while attending Fairfax High in Hollywood. In 1940, she took the stage name Kim Kimberly for the Ben Pollack band, where she met and married trumpet player Bobby Clark. Both Kim and Bobby stayed with Pollack when his band became the Chico Marx Orchestra. Kim also sang with Les Brown's band and was very close to Hoagy Carmichael. 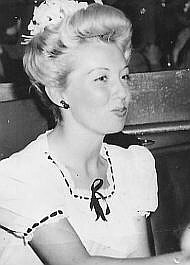 Kim Clark Munroe, daughter of Kim and Bobby, says: "My parents divorced when I was 2, and my mom gave up showbiz and married a second time to a Marine pilot in 1946". After the stint with the Chico Marx Orchestra, Bobby continued to play, mostly in Les Brown's Band during all the Viet Nam era USO's and beyond until his death in 1981. Kim Clark Munroe: "I remember Chico and his wife babysitting for me when I was very small. My parents lives seem so exciting compared to mine, but those were exciting and interesting times"
Elisse sang with the band for about a year (1942). She had previously sung with the Hudson-De Lange orchestra ( 1938-1940), during which time she made a few Bluebird records with Delange, and a couple with Tony Pastor's Orchestra. Chico called her Sugar "cause she's so sweet"
(1920-1995) Ziggy's career in show business started when he enlisted in the Army and became entertainment director of Fort Hamilton, Brooklyn. He was often billed as Corporal Ziggy Lane. After the Big Band Era he went on to have his own TV show, “TV Dinner Date,” based in New York. He later moved to Miami, Florida and became a composer and helped to launch careers of some local performers. He also served as president of Carousel Records for a time. Born as Scipione Mirabella. Most known for his vocal works with the Glenn Miller and Tommy Dorsey orchestras. Present-day rapper Copywrite is his grandson. According to a note on 28 April 1944 in newspaper The Saratogian, Saratoga Springs, New York, Hank was formerly associated with the Chico Marx Orchestra. He went on to play clarinet with Don Beston and Bobby Hackett (info provided by Nancy Mess).